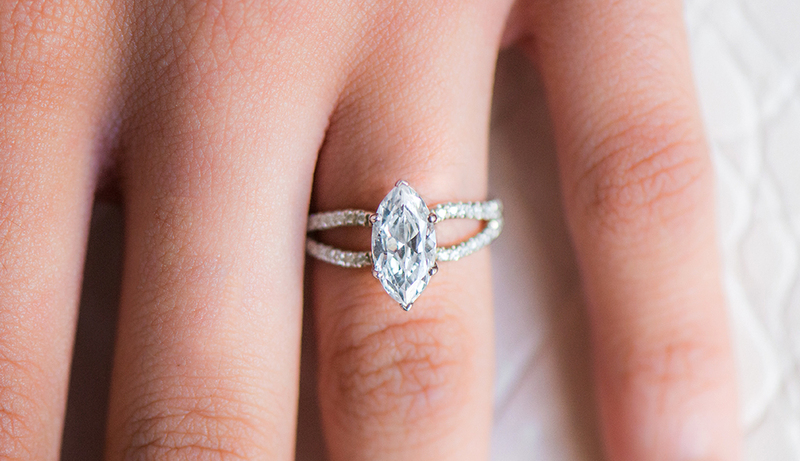 Graceful and elegant, marquise cut diamonds are the only kind of side-eye you’ll ever want to give… or receive! If eyes are the window to the soul, then marquise cut diamonds are the sparkly window dressing. These eye-shaped beauties, with their curved sides and pointed ends, give the appearance of a watchful guardian protecting the wearer from a life less lustrous. 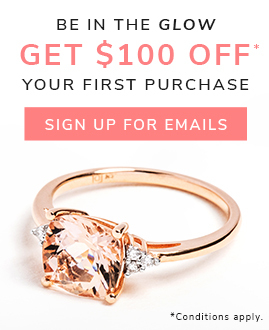 Like the gentle outline of oval cut diamonds, but want to score some extra brownie points with your SO? Point your attention to marquise cut diamonds, which are blessed with not one but two points — one at either end. Typically set in a ‘north/south’ orientation, the marquise cut makes fingers seem longer and more slender. Its elongated shape also creates the illusion of a larger stone, carat for carat, especially when set with round or pear-shaped side stones. Marquise cut diamonds are not lacking in the sparkle department either. Boasting approximately 58 facets, these “fancy shape” stones are more than capable of lighting up a room. Who Rocks Marquise Cut Diamonds? Victoria Beckham, Jacqueline Kennedy Onassis, Jerry Hall, Catherine Zeta-Jones, Katie Cassidy, Holly Marie Combs, Portia de Rossi, and Ashlee Simpson. We don’t mean to tease with celebrity marquise; here’s a more affordable lookalike to put your mind at ease. 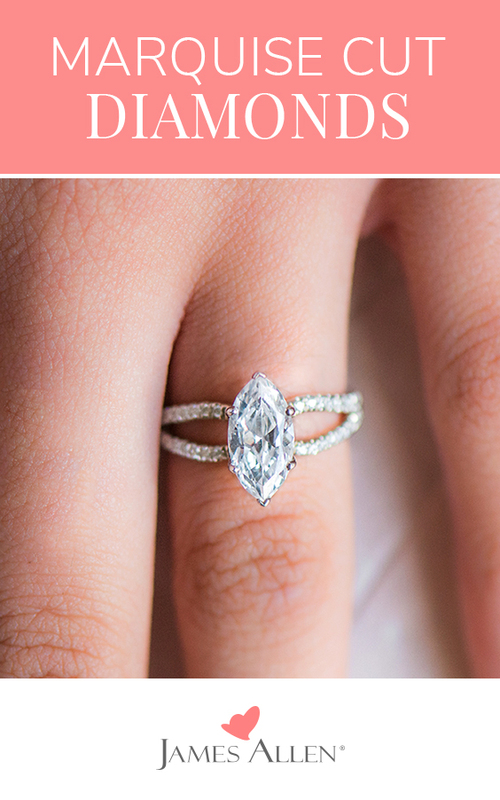 What to Know About Marquise Cut Diamonds? 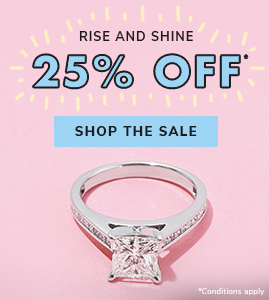 Go Deep as Your Love – Choose a diamond that hasn’t been cut too shallow, otherwise light could leak through the stone diminishing its fire and brilliance. Get Symmetrical – Both endpoints of a marquise cut diamond should be perfectly aligned; otherwise, they can throw the stone off balance once it’s mounted in the setting. Beware the Bow Tie – Marquise cuts tend to produce a darkened area at the center of the gem that resembles a bow tie. A well-polished brilliant cut diamond should hide this undesirable effect. 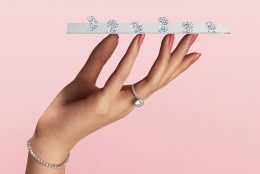 Block Off the Old Chip – Like any diamond cut with exposed corners, the ends of a marquise cut need securing. V-tip prongs are widely considered to offer the best protection from chipping. Mad about marquise? Go on a spree for the perfect marquise! 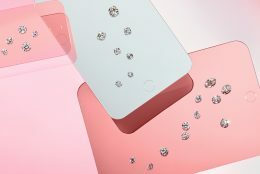 Don’t forget — you can view all of the marquise cut diamonds on JamesAllen.com in glorious 360° HD at up to 40x SuperZoom. Once you’ve found the marquise to your true love’s heart, let us know in the comments below or on our social channels: Instagram, Facebook, Snapchat, or Twitter.